A reopening auction today of a 10-year Treasury Inflation-Protected Security generated a real yield to maturity of 0.578%, the lowest for this term since January 2018. The reopening of CUSIP 9128285W6 created a 9-year, 10-month TIPS. It carries a coupon rate of 0.875%, which was set by the originating auction on January 17, 2019. At that January auction, the real yield (meaning yield above inflation) was 0.919%, about 34 basis points higher. Because today's real yield came in below the coupon rate, investors had to pay a premium - an adjusted price of about $102.48 for about $99.69 of value. This TIPS will have an inflation index of 0.9969 on the settlement date of March 29, reflecting slightly-below-zero inflation in recent months. Real yields have been falling dramatically since late 2018. In January, the Federal Reserve indicated it was reversing course and putting the brakes on future increases in short-term interest rates. As recently as November 21, 2018, a 10-year TIPS reopening generated a real yield of 1.109%, about 53 basis points higher than today's result. That's a huge swing in only four months. As I noted in my preview article, I wasn't a fan of this TIPS at this yield. I noted that a wiser investment in March 2019 is to by U.S. Series I Savings Bonds before April 30 to lock in a fixed rate of 0.50%, only about 8 basis points below today's result. I Bonds have advantages of flexible maturity, tax deferral and rock-solid deflation protection. The fixed rate is likely to be reset lower on May 1, but purchases before that date keep the 0.50% rate until the I Bond is redeemed or matures. With a nominal 10-year Treasury yielding 2.52%, this reopened TIPS gets an inflation breakeven rate of about 1.94%, 11 basis points higher than the result in January. This is "fair value," in my opinion. U.S. inflation has averaged 1.8% over the last 10 years. 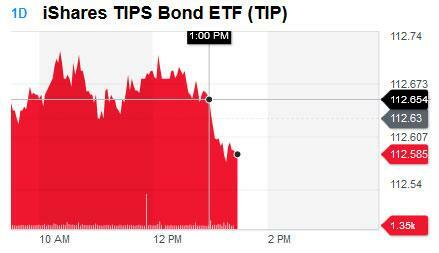 The price of the TIP ETF - which owns the full range of TIPS maturities - moved down immediately after the auction's close at 1 p.m. EDT, which indicates slightly higher yields in the wake of the results. This also probably indicates lukewarm demand for this offering. Just before noon, CUSIP 9128285W6 was trading on the secondary market with a real yield of 0.56% and has since risen to 0.58%, in line with the auction's 0.578% real yield. The bond market seemingly has escaped the much-feared apocalypse and is settling into the idea that bond yields may end up being stable, or lower, over the near term. The 10-year German bund is trading today at 0.046%, massively lower than the 2.52% of a U.S. nominal 10-year. U.S. yields aren't likely to climb higher until global yields begin climbing. Recommendations. Lock in the best yields you can find. For nominals, that probably means 4-week (2.45%) or 13-week (also 2.45%) Treasurys, avoiding longer-term options like a 5-year (2.34%). And if you can find 5-year bank CDs yielding 3.25% or higher, grab them. For inflation protection, again, I recommend investing in U.S. Series I Savings Bonds, which will offer a permanent fixed rate of 0.50% for purchases through April 30. That fixed rate is equivalent to a TIPS's "real yield to maturity," but I Bonds have many advantages that make them preferable to TIPS. I'll be writing more about I Bonds in the next month.